Optimist International President Dave Bruns is instituting a GROWTH SURGE in our organization. do something about it. To that end, he's embarking on a Growth Surge Tour in Quebec, Ontario and Michigan, Saturday, October 24 to Wednesday, October 28, 2015. When Dave was an Optimist International District Governor, a requirement for a district to earn Distinguished recognition was to build seven or more clubs depending on the size of the district. Today the requirement is only one and unfortunately, not all districts accomplish that small contribution to the longevity of our mission. Sadder still are the number of Optimist Clubs that fail to add at least one new member each year. If every Optimist Club were to end the Optimist International administrative year with one more member than it had when they began, we'd be set on a course to help us reach 100,000 members by the organization's 100th anniversary. If every club were to reach the Honor Club distinction, we'd signify the longevity of the organization well into the future. 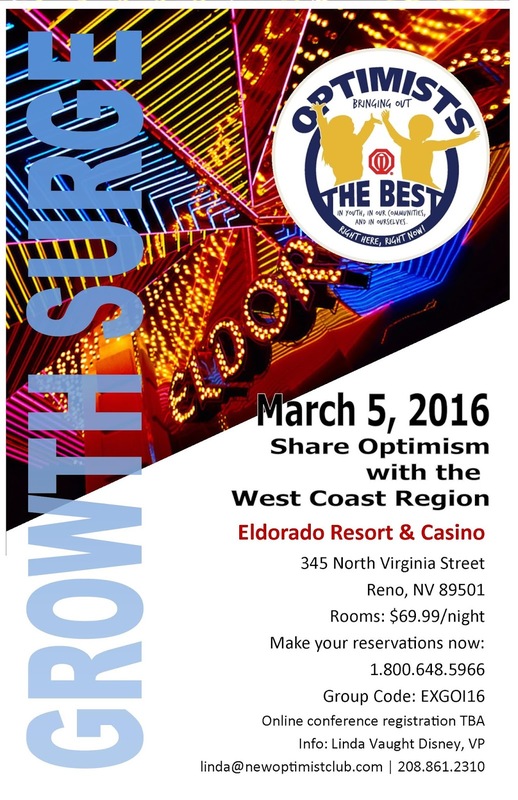 How can your Optimist Club can be a part of the Growth Surge? Host a New Optimists Wanted event in your community and share optimism with potential members. Have a strong closer and be sure they join your Optimist Club today. Always be asking your friends, families, and others to join with you to make your community a better place to live. Helping your Optimist Club work on a community service project may be a great place for a potential new member to start, but let them know that they can make a bigger impact when they join your Optimist Club and commit to a long-term pattern of service. Start a new Optimist Club and share optimism with a whole new community of volunteers. Don't do it alone: call your PNW District leadership team to help you start and finish your project in a timely manner. 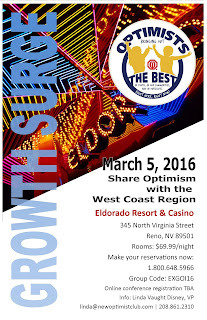 Plan today to attend the West Coast Region Growth Surge meeting on March 5, 2016. Details are included in the picture; click to enlarge and print. Let's help ourselves do more in our community by being a part of the Optimist International Growth Surge today. 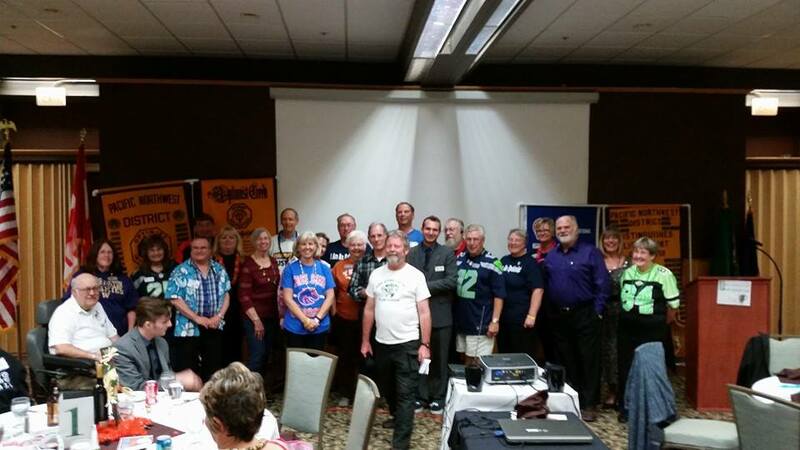 Optimist Club members from Idaho, Oregon, Washington and British Columbia came together in Hood River, Oregon on October 10, 2015 to celebrate the new Optimist Club year. Led by Mike Gray, Governor 2015-2016, it is easy to say that fun was had by all. There were hamburger and pancake flippers, junior golf tournaments, alcohol monitors and many more varied projects that our Optimist Clubs carry out each year. It was easy to see that the fundraising projects were equally as well liked as the community service projects and that is probably because of the cameraderie that we share. When we come together as an Optimist Club, we bring out the best in youth, our communities and ourselves. Governor Mike placed an emphasis on fun at the first quarter meeting and Boise State fans were delighted to see their team win at the tailgate party, but we also completed some business including finalizing the policy revisions for the CCDHH and Oratorical Contests, passing a new budget for the year and reviewing the end of previous year financial report and minutes. Optimist International Vice President Linda Vaught Disney encouraged the PNW District to be a part of the GROWTH SURGE being led by International President Dave Bruns and by the end of Saturday evening the assembled group was ready to lead their Optimist Clubs and the PNW District, right here, right now. Here's looking forward to a great year! In 1928, Optimist International started the Optimist Oratorical Contest, the oldest of its scholarship programs. Each year since that time, young speakers have worked their way from the Optimist Club level to the Zone and District level to compete for prizes. The prizes have ranged from medals to modest scholarship awards and for many years, the top prize has been a $2,500 scholarship payable to the college or university of the winning student. Coming in 2016, the Optimist Oratorical Contest is receiving a makeover. It will still involve the Optimist Club, Zone and District levels, but it has been enhanced to be truly international with more scholarship money - $22,500 - to claim. Thanks to a partnership with St. Louis University, District winners will advance to a Regional level for a chance to win an additional $5,000. Winners from each of the 8 Regions will then advance to international competition where they will compete with oratorical contestants from around the world for $15,000. Details for the competition at the Regional and International level are still being finalized; however, students can begin preparing today for their local and state or district-wide events. The theme is "How My Best Brings Out the Best in Others." Students must be 18 years old or younger as of October 1, 2015. Find complete rules and learn more at this link: Optimist International World Championships Oratorical Contest 2016. All scholarship contests begin at the club level. Click here to find an Optimist Club near you. This post first appeared on Experience Optimism, July 30, 2015. Hood River, here we come! 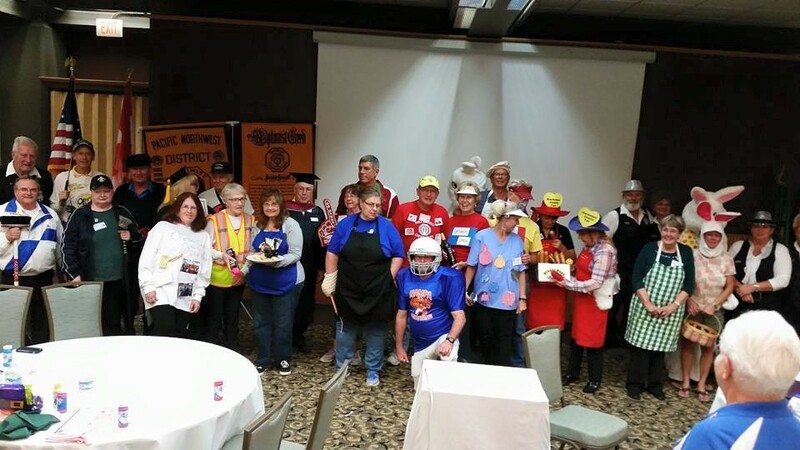 Optimist Club members and newly elected officers from Alaska, Idaho, Oregon, Washington and British Columbia will gather in Hood River, Oregon for the 1st Quarter PNW District meeting on October 9-10, 2015. Following Governor Mike Gray's theme for the year, "Let the Children Play," this meeting will focus on the question, "What is your game?" For fun and information, Governor Mike asks that you come dressed on Friday evening opening session in a costume that portrays your favorite Optimist Club program. On Saturday, the District Board Meeting will be followed by President, S/T and Lt. Governor training and a presentation on the changes to the Optimist International Oratorical Contest. Starting at 4:00 p.m., there will be a tailgate party to celebrate the BSU Football game. Dinner is casual; come dressed in your game shirts or Hawaiian attire. The PNW District's own Linda Vaught Disney will be the official representative from Optimist International. 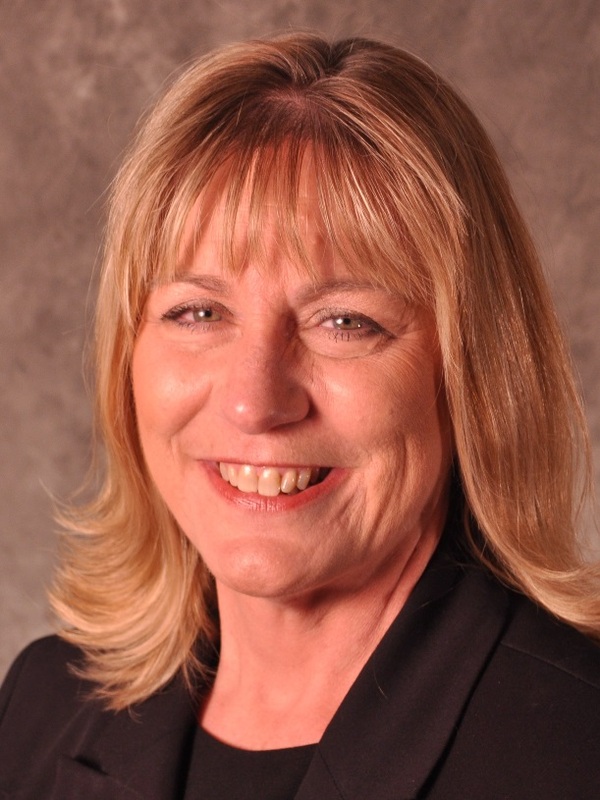 As Vice President of the West Coast Region, she's prepared to share with you how a growth surge in Optimist International will bring out the best in youth, our communities and ourselves. We look forward to seeing you in Hood River. Register now or at the door. 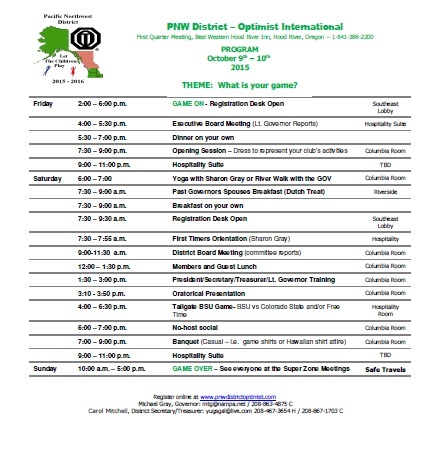 Each year on October 1, Optimist International starts fresh with new officers at all levels of the organization. In the Pacific Northwest District-Optimist International, we welcome Michael Gray to the office of Governor. Michael hails from the Optimist Club of Nampa, Idaho. Michael has chosen the theme "Let the children play" to guide the District for the 2015-2016 administrative year. Please watch his video to learn more.